Birthday party ideas for kids and teens. Plan a great party for your kids birthday. Involve them in the planning, or make it a surprise. Either way, they will have a great time. Beach Party - Reserve a table or spot at your local beach, or arrive early to claim your spot. Kids of all ages love water and sand, so it's hard to go wrong if the weather is nice. Be sure to have enough adults present to supervise. 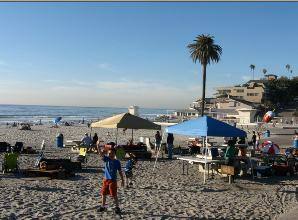 Here is San Diego, Mission Beach, La Jolla Shores and Moonlight Beach are some of my favorites. Boomers - A popular family entertainment center offers birthday parties. Kids can enjoy the bumper boats, go karts, rock wall, miniature golf and game room. Bowling - A classic birthday party is a trip to the bowling alley. Ask if they have "bumper bowling" for the younger kids. Build-a- Bear - A build a bear workshop is a fun activity for younger kids, and they get to keep their bear a their party favor. Chuck-E-Cheese's - Entertainment, and pizza for the younger crowd. Local craft and pottery places offer parties where you can create your own ceramic art and pottery. 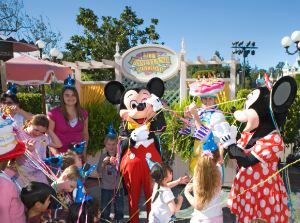 Disneyland - The number one vacation destination and a favorite for families is a vacation at Disneyland California. You can have your birthday party at the happiest place on earth. Just remember it can get expensive! Go-Kart Racing - Go cart racing can be fun. Be sure to check the height restrictions for riding and driving so everyone can participate. In San Diego north county, try K1 Speed. Ice Skating - Ice skating at a local rink or pond is another favorite birthday party idea. Make sure the kids are old enough, as some may not know how to ice skate (ages 8 and up recommended). Laser Tag - Laser tag is one of my favorite childrens birthday party ideas. If you have an Ultrazone or other high quality laser tag location in your area, this is a blast for both boys and girls. Minature Golf - A fun birthday party activity for kids of all ages and skills. Movies - Another favorite is going to the local movie theatre. Check out the list of movie theatres in San Diego. Museum - Museums can get one of the best childrens birthday party themes if you have a local museum that matches the interest of the birthday child, such as a space museum or train museum. Sometimes they have a party room, or a nearby park for a picnic and birthday cake. San Diego Balboa Park has many great museums for birthday parties. Nature Hike - A local botanical garden or park may have a hiking trail with interesting things to see for kids. The San Diego Botanic Garden has a great children's garden. Paintball - Older boys and teens may want the challenge of paintball. Park - Reserve a picnic area in your local park, or have an adult arrive early to claim your spot. 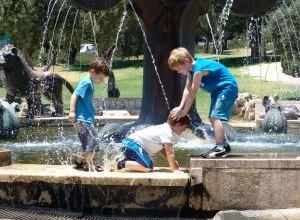 Check out the best location in advance based upon your kids interests. You may fly kites, feed the ducks, play frisbee, play on the playground structure and sandbox, have a treasure hunt, etc. This is one of the best birthday party ideas for kids. Rock Climbing Wall - Older kids like the challenge of a rock climbing wall. Some kids who aren't as athletic may prefer a location that also has other activities. Roller Skating - Roller skating at a local skating rink is another fun birthday party idea. Recommended for ages 7 and up. They will usually have a party room that you can reserve, and some will allow you to bring your own birthday cake. Skate boarding - A skate boarding park can be a fun birthday party idea if all the kids skateboard. Otherwise some will feel left out. Swimming Pool Party - Many neighborhoods or communities have a swimming pool that can be reserved for a birthday party. Make sure you have a designated life guard. The Plunge swimming pool in Belmont Park San Diego is a great choice. Water Park -A summer birthday party at a local water park can be a blast. You can rent a private canopy with picnic table and spend the day. In San Diego try SeaWorld Aquatica water park or The Wave Waterpark in Vista. Happy 2019! Be sure to Like us on Facebook! San Diego Events 2019 - Don't miss out on these fun San Diego Events. Disneyland - We just got back from Disneyland aand had a great time. Use those Fast Passes to avoid the lines. Save money with our advice on how to buy Cheap Disneyland tickets. Legoland Coupons - See the San Diego Padres Swinging Friar and more lego art at Legoland. Pick up your discount Legoland coupons before you go. Universal Studios - See Transformers 3D, King Kong 3D and more at Universal Studios Hollywood with this special deal. Get your Universal Studios Discount Tickets. San Diego Zoo and Safari Park - Visit the world famous San Diego Zoo and its wild animal Safari Park. We loved the Cheetah run! Discount Tickets San Diego Zoo. Sea World San Diego - Enjoy the animal shows, rides, and acrobatic shows Sea World Discounts. Copyright 2009 - 2019 San Diego Beaches and Adventures. All rights reserved.